In the middle of a desert, a few important things rise to the surface. Man and animal become united with a common goal. Sharing takes on a new meaning. 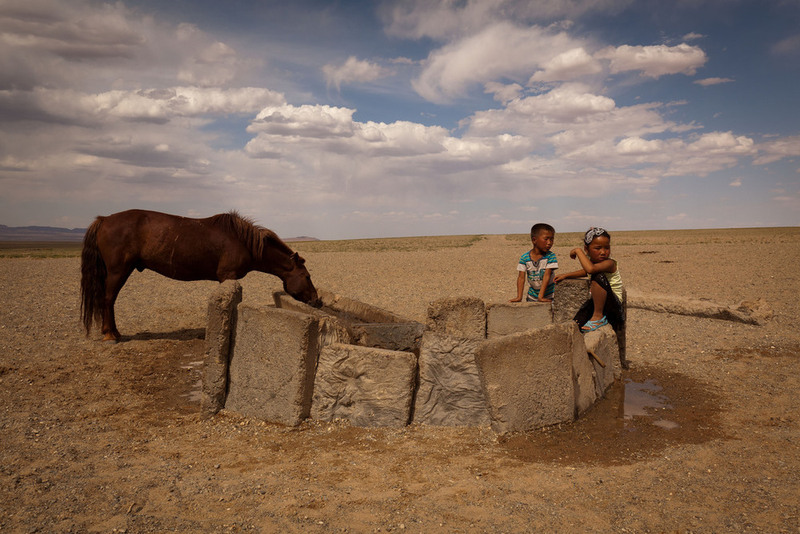 At a watering hole in the middle of the Gobi desert, kids and horses alike, enjoyed the friendliness and comfort of the watering hole, taking turns. It was apparent that this was elixir. June 23, 2012 in "Eagles", "San Juan"
Maybe he is a chef. Or a fisherman. Or even perhaps an eccentric recluse. He drove up to this meadow in a beat-up red Honda and pulled out a pail of salmon pieces from his truck. He walked up to the tree line and threw in a few pieces to the feral cats that were waiting for him. Then he walked to the other side and fed a fox that was too shy to step out of the shade. Then he dumped the rest of the pail into the middle of the meadow. For a few minutes nothing. Then swoosh. Majestic bald eagles, with wing spans as wide as six feet dove down, gliding, with their talons outstretched picked up the salmon, and clumps of grass with it, and with a few strokes of their massive wings rose to the top of the trees. As he left, I said "Thank You". "Enjoy", he muttered and was gone. July 28, 2011 in "Mongolia", "lasso", "mares milk"
It sounds so easy. To anyone who has seen a cow being milked. Passive creatures, huddled together in close quarters, connected to machines, gladly donating their elixir for the goodness of man. Imagine however, that they could gallop. Were not quite wild, but not domesticated either. Free to roam in the open. Could buck and kick, and could only carry enough milk that they had to be milked every two hours for any significant benefit. Now you are a little closer to the reality of milking a mare. The idea is simple. If you want to milk the mare, catch the foal. Sounds easy. If the stallion is subdued the herd can be led into the corral and the foals can be cornered either by lasso or by crowding them. If, however, the stallion runs wild, the foals must be captured the hard way - on horseback with a loop at the end of a big stick. Once the foals are caught, they are tied to a harness stretched across the ground with a temporary bridle and a very short leash. This serves two purposes. First, the foals stand there with their heads down and tend to quieten themselves and often lie down. Secondly, and more selfishly, it is impossible for them to suckle their mothers, thereby leaving the mares to be milked. Nature takes over. The mares give up the run and come stand next to their foals. One at a time, the foals are untied, allowed to drink some milk, and while they are held close to the mare, quickly a pint or two are collected in a bucket. As Tsetsgee milks the mare, she sits on her haunched with a bucket caught between her legs and is done before the mare misses the foal. It is magic, this relationship between the Mongolians and their horses.